BE NATURAL: THE UNTOLD STORY OF ALICE GUY-BLACHÉ Q&A's with filmmakers and guests starting Friday, 4/19 through Sunday, 4/21 at the Monica Film Center. Filmmakers Pamela B. Green (director) and Joan Simon (co-writer) with Kathy Bates, Kiernan Shipka and Catherine Hardwicke. Moderated by Evan Kleiman. Filmmakers Pamela B. Green (director) and Joan Simon (co-writer) with Cari Beauchamp, Teri Shropshire and Patricia Riggen. Filmmaker Pamela B. Green (director). Filmmaker Jon Wilkman, film archivist Dino Everett, and film historian Anthony Slide. With David Kipen serving as moderator. 'The Untold Story of Alice Guy-Blaché' is essential viewing for those who want a complete perspective on the history of film. 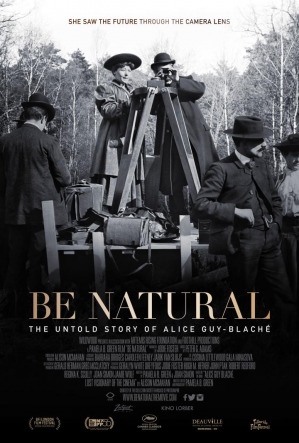 Narrated by Jodie Foster, Be Natural: The Untold Story of Alice Guy-Blaché is a documentary about the first female filmmaker, exploring the heights of fame and financial success she achieved before she was shut out from the very industry she helped create. Guy-Blaché started her career as a secretary to Léon Gaumont and in 1896, at 23, was inspired to make her own film called La Fée aux Choux (The Cabbage Fairy), one of the first narrative films ever made. Over the span of her career, she wrote, produced or directed 1,000 films, including 150 with synchronized sound during the ‘silent’ era. Her work includes comedies, westerns and dramas, as well as films with groundbreaking subject matter such as child abuse, immigration, birth control, and female empowerment. She also etched a place in history by making the earliest known surviving narrative film with an all-black cast. After a decade of making films at Gaumont she had a second decade-long career in the U.S., where she built and ran her own studio in Fort Lee, New Jersey. Pamela Green has dedicated more than eight years of research in order to discover the real story of Alice Guy-Blaché (1873-1968) – highlighting not only her pioneering contributions to the birth of cinema but also her acclaim as a creative force and entrepreneur in the earliest years of movie-making. Green interviews Patty Jenkins, Diablo Cody, Ben Kingsley, Geena Davis, Ava DuVernay, Michel Hazanavicius, and Julie Delpy—to name just a few—who comment on Guy-Blache’s innovations. Green discovered rare footage of televised interviews and long archived audio interviews which can be heard for the first time in Be Natural, which allows Alice Guy-Blaché to tell her own story. Be Natural premiered at the Cannes, Telluride, New York, Deauville and London Film Festivals in 2018.